Generations of New Englanders remember fondly the glorious downtown department stores at Christmas. Those great retail palaces brought magic to the holidays with stunning window displays, conversations on Santa’s lap and walk-through enchanted villages. 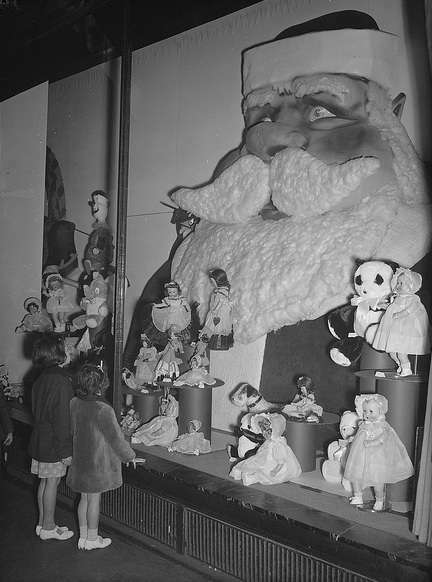 Window shopping at Christmas at one of Providence's downtown department stores, 1940. Photo courtesy Library of Congress. The holiday season brought out the best in the great downtown department stores. They were at once arbiters of quality and fashion, makers of dreams, vibrant elements of city life and landmark consumer paradises. A trip to a department store often marked a milestone. There we bought a back-to-school outfit, a wedding dress, a new suit for the first job. 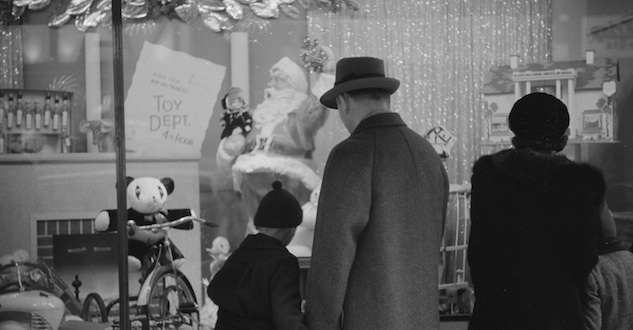 And at Christmas, the trip to the downtown department stores meant – well, Christmas. 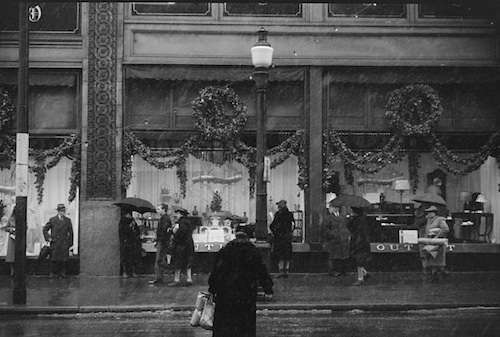 Filene's Christmas decorations, 1950. Photo courtesy Boston Public Library, Leslie Jones Collection. 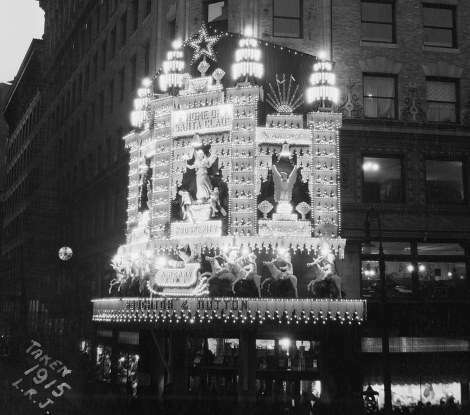 During the heyday of Downtown Crossing in Boston, carolers serenaded shoppers atop the Filene’s marquee, a giant manger scene loomed above Summer Street at Jordan Marsh and three large gold bells swayed with the Christmas music. "I remember going to Downtown Crossing in the early 1970’s and being met by enormous crowds of people who were towered over by the Boston Police officers on their mounted horses…what a sight!," commented Ellis Paulman. "I visited Gilchrist’s, R. H. Stearns, Filene’s, and Jordan Marsh," he wrote. "It was an exciting time and an exhilarating experience for this small-town boy from Connecticut!" Jordan Marsh nativity scene, 1950. Photo courtesy Boston Public Library, Leslie Jones Collection. In Hartford, a Christmas village with historic Connecticut buildings built to scale rested atop G. Fox’s marquee, and for several years the store windows featured Christmas paintings from the Wadsworth Athenaeum. The three great Providence stores on Westminster Street – Shepard’s, Cherry & Webb and Gladdings – decked themselves out for the holiday, and if you got lost you waited for your parents under the tall, neon-lit Shepard’s clock. Internet sites are filled with blogs and websites devoted to department store history. eBay does a brisk business selling branded items from favorite stores. Books have been written about them: Denholms: The Story of Worcester’s Premier Department Store, G. Fox & Co.: Where Connecticut Shopped and Filene's: Boston's Great Specialty Store. Downtown Providence at Christmas, 1940. Photo courtesy Library of Congress. Today, the great Providence Shepard’s store – once the country’s largest -- is used by the University of Rhode Island. The Porteous flagship store on Congress Street is the Maine College of Art. Sage-Allen in Hartford was converted to luxury apartments. Jordan Marsh’s Enchanted Village is now at a Jordan Furniture store in Avon. What remain as department stores are invariably Macy’s. You brought your best self to the great old downtown department stores and you hoped to find something better: the wondrous toy, the fantastic dress, the wild extravagance you just had to have. 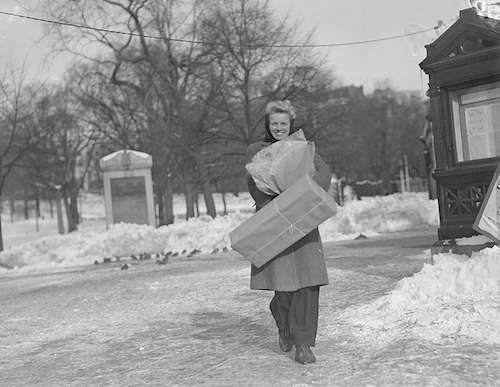 A shopper at Boston's downtown department stores, date unknown. Photo courtesy Boston Public Library, Leslie Jones Collection. For roughly 50 years, from the 1920s to the 1970s, downtown department stores transported customers from their everyday cares. Their vast assortments of merchandise put flesh on our admittedly materialistic dreams. The stores sent buyers all over the world to bring back wares to would wow customers. Filene’s opened a Paris office in 1910, which established its reputation as a fashion authority and stocked its high-end French Shop. That was just one of many at Filene’s flagship store, designed by the great Daniel Burnham. There was ‘Young Breed,’ ‘Varsity Shop’ and ‘Junior Gown Shop.’ There was a special repair department, back when broken merchandise was repaired rather than replaced. Filene’s was known for its Lilly Pulitzer clothes, Kimberly knits, its ski shop, its cruise shop, its Oxford shop and its fine men’s clothing. And the basement! Filene’s paid 10 cents on the dollar for leftover merchandise from stores like I. Magnin. Bargain hunters could thrill to the shopping hunt with end-of-season luxury goods at a fraction of their original prices -- with labels and original price tags still intact. 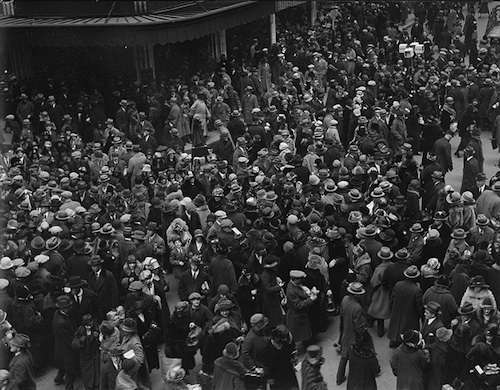 Christmas crowds at Downtown Crossing, date unknown. Photo courtesy Boston Public Library, Leslie Jones Collection. Items purchased at the great department stores sometimes took on special significance. Such was the case of a handkerchief from R. H. Stearns, a 10-story emporium that offered simple elegance to little old ladies from Beacon Hill. Downtown department stores treated customers like royalty, but perhaps no store treated customers better than G. Fox. Its motto: The customer is always right. G. Fox flagship store, Hartford. Beatrice Fox Auerbach, the beloved matriarch who presided over G. Fox’s glory years, would not allow a customer to go away unhappy. The hallmark of G. Fox since her grandfather founded it in 1847 was free home delivery –- first by wheelbarrow, then by horse-drawn carriage, and finally by automobile and truck. In 1947, G. Fox celebrated its centennial by delivering packages by helicopter. Auerbach was so anxious to please customers that on Christmas Eve she kept a small staff and drivers on standby until midnight for desperate parents who still needed a Christmas gift. As far back as 1917, Hartford had an amazing emotional attachment to G. Fox. When the five-story store burned down that year, 98 percent of the customers still paid their bills though all customer records had been destroyed. The owners paid employees their salaries during construction of the new store, and Hartford merchants let G. Fox sell its goods in their storefronts. 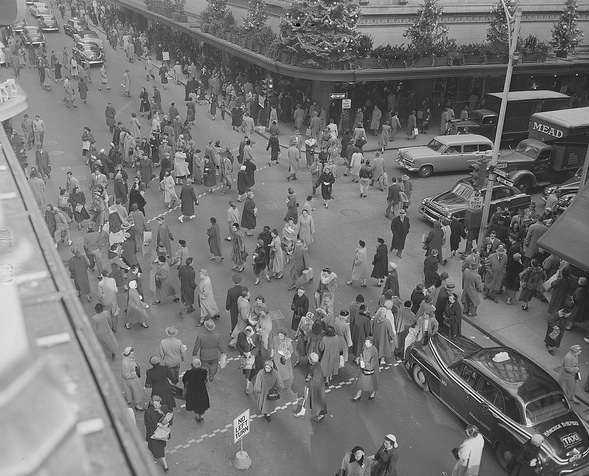 The great downtown department stores treated their employees well, with employee cafeterias, on-site nurses, paid vacations and sick days and benefits. Auerbach promoted minority employees at G. Fox well before it was the norm. Edward Filene encouraged the company’s union and instituted profit-sharing. His brother Lincoln stood at the door on Christmas Eve and shook the hand of every Filene’s employee. As a result, department store employees could be fiercely loyal. For example Cherry & Webb employee drowned during the Hurricane of 1938 while trying to rescue the furs in the Providence store's basement. Holiday decorations at Houghton & Dutton, one of Boston's great lost downtown department stores. Lowell’s Bon Marche in 1938 had 62 employees who were 10-year veterans of the store. “I loved, loved, loved working for this store,” wrote one Jordan Marsh employee. A G. Fox employee tells of his late mother who retired from G. Fox. She proudly won many customer service awards and was buried wearing the G. Fox name badge. Shopping filled the senses at the great downtown department stores: the ring of the bell, the smell of the city, the marble, mahogany and brass and most of all merchandise displayed in elegant wooden and glass cases. Window shopping at the downtown department stores in Boston. Photo courtesy Boston Public Library, Leslie Jones Collection. Children found it exciting to dine in the elegant restaurants of the downtown department stores, like the Venetian Tea Room at Read’s in Bridgeport or the Top o’ the Town Restaurant at Forbes & Wallace in Springfield. They had to wear their Sunday best and put on proper manners were required. "It was a tradition in my family to go to Providence on Thanksgiving night to walk off our big dinner and to window shop," commented Gail Merrill. "It was the first night that they lit the Christmas lights and all the store fronts had beautiful displays! The dolls and train sets were sure to be on every child’s list! Shepard’s, Gladdings, and the Outlet window displays rivaled New York’s. Oh the memories!!! Each department store had a signature food item. Shepard’s in Providence had chicken croquettes, while Gilchrist's in Boston had almond macaroons. Sage-Allen in Springfield smelled like sticky buns, so spicy they almost burned the tongue. The aroma from the bakery wafted up the escalators, drawing customers into the basement. Date nut bread sandwiches with cream cheese were a favorite at G. Fox. And Jordan Marsh’s blueberry muffins were a required treat at the end of shopping trips to Boston. Since the bakery closed in the early 1990s, baker John Pupek opened the Jordan Marsh Blueberry Muffin Co. in Brockton, which sells the muffins at Macy’s in Portland. With roots in 18th- and 19th-century dry goods stores, the department stores flourished because New England flourished. For a time, New England cities supported several of the country’s largest downtown department stores. Providence merchant Benjamin Thurber in 1766 founded the oldest, Gladdings. The store's bunch of grapes insignia therefore became the longest continuously used trade sign in American history. Yankee merchants also founded Jordan Marsh and R. H. Stearns. Eben Jordan founded Jordan Marsh in 1841, and then R. H. Stearns founded his eponymous store in 1848. Many department stores had immigrant roots. Gerson Fox, who opened G. Fox in 1847, was German Jewish, as was William Filene, who founded his namesake business in 1881. Forbes & Wallace founder Andrew Wallace was born in Scotland, and Worcester’s Denholm & McKay founder William Denholm was a native of Dundee. 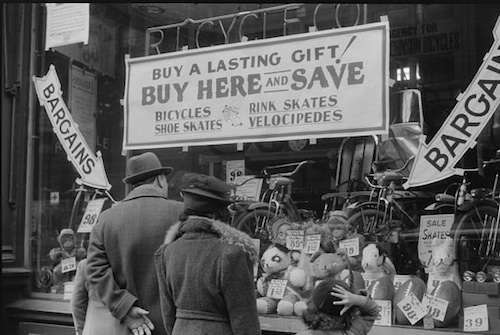 Shopping for Christmas bargains at downtown department stores in Providence, 1940. Photo courtesy Library of Congress. The rise and fall of Bon Marche in Lowell, Mass., typified the fate of downtown department stores. Lowell native Frederic Mitchell opened his first store on Merrimack Street in 1878, displaying merchandise on draped packing cases so the millworkers would eye it as they passed by. As a result, millworkers flocked to Bon Marche on the day the ghost walked – payday. During the world wars, Lowell’s mills churned out munitions and textiles to clothe the troops and Bon Marche helped with the war effort. During World War I, Bon Marche collected peach pits for gas masks, and sold war bonds and stamps during both wars. After World War II, Bon Marche went back to its main marketing proposition by offering deals that couldn’t be beat and rock bottom prices. The store furthermore had a big rock sticking out of the basement floor, a glacial erratic too large to remove during construction. When Lowell struggled, so did Bon Marche. By 1976, Bon Marche turned into a Jordan Marsh, and by the 1990s, the building had no tenants. The high water mark for Boston's downtown department stores probably came in 1956, when it had seven department stores at Christmas: R.H. White, Gilchrist’s, R.H. Stearn’s, Raymond’s, Kennedy’s, Jordan Marsh and Filene’s. 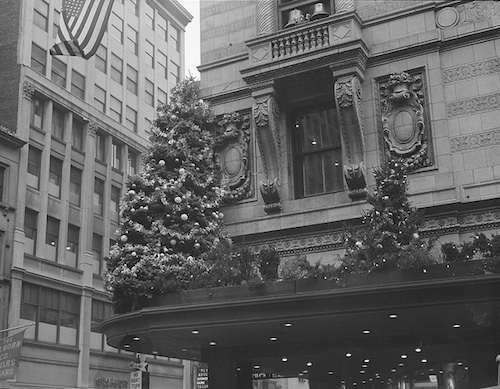 At Downtown Crossing pre-1956, the year downtown department stores reached their peak. Photo courtesy Boston Public Library, Leslie Jones Collection. It would be the last Christmas for R.H. White's, the first victim of the middle-class flight to the suburbs. Then after 100 years in business, Raymond’s declared bankruptcy in 1972 and killed off its spokesman, the swamp Yankee Uncle Eph. Subsequently in 1976, Gilchrist’s, one of the big three in Downtown Crossing with Jordan’s and Filene’s, closed 134 years after it opened. R. H. Stearns, which had towered over Boston Common in a landmark building for seven decades, shut its doors in 1978. Kennedy’s then closed in the early 1980s, having grown from a small men’s store in 1892 to a fixture of New England retailing. 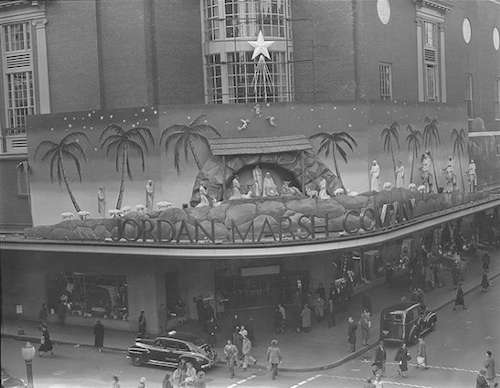 Jordan Marsh became a Macy’s in 1996. And finally Filene’s, the last to give up the ghost, became a Macy’s in 2006. Memories of the great old downtown department stores live on, though, in tissue-wrapped ornaments tucked away in Steiger’s boxes or childhood Santa photos from Sage-Allen. How we miss those downtown department stores. Special thanks to the Department Store Museum and Shopping Days in Retro Boston. This story about downtown department stores was updated in 2018. Miss these stores and what they did for downtown. Sorely, sorely miss those years. Porteous, Portland had elevator operators! Was Read’s in Hartford? In the 1980’s I worked at Read’s in Southbury, Ct but the main store was in Bridgeport, CT.
store window display & Filene’s tolling of the bells. Days gone by..
Whoops, we meant to put Read’s in Bridgeport! G. Fox, Steiger’s and Sage-Allen were the Big 3 in Hartford. My parents remember the Jordan Marsh muffins. I don’t remember Steiger’s ever being in Hartford, I remember G. Fox, Sage-Allen and Korvetts. Steiger’s was out of Springfield I thought. I remember Christmas shopping in Boston. The streets were so crowded they had mounted policemen on beautiful horses to maintain crowd control. Remember? Sage-Allen’s in Old Saybrook was my first job at Christmas in gift wrap! Great memories! In Nashville, it was the beautiful windows of Cain Sloan, and the Nativity Scene in Centennial Park set up by Harvey’s. A trip to downtown for shopping was an event, and we dressed up to go. Far more civilized than than the riots created by an incited mob mentality to get THE bargain. It brings back such wonderful memories! People dressed up to go places, even shopping! It was an elegant time. Going in to town on the train was a special event back then! It is a shame it has all changed. I saw on the news a woman was excited that she got a 100 PC. Kitchen something for $10. . She thought it was at bargain. It looked cheap to me. Now a bargain was a cashmere sweater for $10 in Filene’s or Jordan’s Basement!!!! Now the choices are Macy’s, Macy’s, and (did I mention ?) Macy’s! I remember going to G Fox and thinking it was the best day ever! Worked at JM a few months post college in the mid 50s. Loved it and always loved the store. . .and the annex! My father worked as a kid in R H White’s and at Christmas they used the new song, “White” Christmas for advertising, playing it repeatedly. When I was a kid my grandfather took me every year to see Santa at Jordan Marsh. Also I used to love to go with him at other times of the year because I loved to ride the escalators. I also remember going to Jordan’s with my mother or father in Medford Ma, and to Filene’s in Winchester. These were smaller, branch locations. It was a lot of fun to go to these stores in those days. They were a destination in themselves. Also, I worked one Christmas at Jordan Marsh in Boston. The people were very nice, it was hard work with all the crowds, but a good experience because of the friendly and helpful staff. I worked at Jordan Marsh one Christmas, it was mobbed at that time of year. Hard work but it was a nice company to work for. People were helpful and friendly. My dad worked at RH White’s as a teenager, he often talked about how, at Christmas that year, the song White Christmas as just out, and White;s would play it over and over…dreaming of a “White” Christmas. My grandfather took me to Jordan Marsh often as a child and I loved to ride the escalators. Also I loved the Christmas village and visiting Santa. We lived in the suburbs, and my mom liked to go to Filene’s annex in Winchester Square. We also went to Jordan Marsh’s store in Medford. “When the customer was always right.” Remember a lot of these named stores. This is the main reason I went to New York this weekend, I had to see a real department store like the good old days. I went to Macy’s and it was breathtaking! The good ole days! My Mother told me she always missed Bon Marche. I just miss going to Boston Filene’s and Jordan Marsh to get my Christmas shopping done in one day! For us it was McWhirr’s in Fall River. 6 levels including the huge toy section and Santa in the basement. My grandmother used to take us on the orange line every year to Jordan Marsh to see the Christmas display – great memories! Grover Cronin’s in Waltham, MA was one of the department stores going all out for Christmas. Even had a parade when Santa arrived. This is not New England, but we all loved those old Department Stores. Our nephew’s company, Dalmark, has recently converted the treasured Heer’s Department Store in Springfield, MO into luxury apartments preserving a beautiful building on the square in downtown. I don’t think the shopping area in Boston was called Downtown Crossing until they redid it all and closed the streets to traffic. When was that, the late 70s or early 80s? Before that it was just called Washington St. Fond memories of shopping there at Christmas time. The stores had the most beautiful window displays. Molly Landrigan’s memories stirred mine! I remember going to Downtown Crossing in the early 1970’s and being met by enormous crowds of people who were towered over by the Boston Police officers on their mounted horses…what a sight! I visited Gilchrist’s, R. H. Stearns, Filene’s, and Jordan Marsh. It was an exciting time and an exhilarating experience for this small-town boy from Connecticut! By the way, Hartford hosted a Steiger’s department store for a while before it closed sometime in the 1950’s or 1960’s. 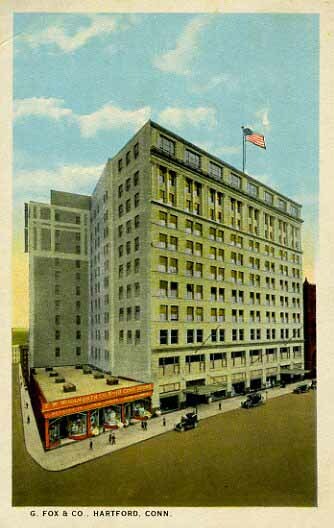 Steiger’s flagship store in downtown Springfield stayed in business until the 1990’s. Hartford also was home to Wise & Smith (which was taken over by E. J. Korvette), Sage-Allen, and G. Fox. All of course are all gone now. Go to Greenfield, MA if you want the department store experience without a Macy’s name: Wilson’s Department Store. It reminds me a lot of Steiger’s and Sage-Allen! I miss Steiger’s and Johnson’s Bookstore in Springfield, the Springfield Library, too(still there)! My Dad was the Manager of the furniture department at Gladdings in Providence. I was in grade school. We lived in a small house under a horse chestnut tree close to where the road forked. One grade went down where the “rich people ” lived and the other to the beach. If I had any address I would look it up on the Internet. Got my first bike there. The nice downhill was fun. I used to speed up and stand on the seat with my arms out. It sure did scare the drivers coming up the hill. It was a tradition in my family to go to Providence on Thanksgiving night to walk off our big dinner and to window shop. It was the first night that they lit the Christmas lights and all the store fronts had beautiful displays! The dolls and train sets were sure to be on every child’s list! Shepard’s, Gladdings, and the Outlet window displays rivaled New York’s. Oh the memories!!! The Christmas trips from Nahant, Mass to Boston to see Santa are a huge part of my cherished childhood memories. Which one was it that had the toy electric train set up to make it easier to keep the kids in control while waiting to see Santa and have pictures taken with Santa?Later as a college student at Boston Univeristy, I worked Filene’s basement at Christmas for extra money for clothes and books! In the 1950’s and 60’s there was a lady named Rose Gildea who managed Jordan Marsh’s Washington St. top floor restaurant. In June of 1968, she was transferred to the Jordan’s restaurant at the newly opened Burlington Mall. She was a no nonsense lady who ran a tight ship. Does anyone remember her? It was such a wonderfilled era to witness and few today can know the sheer excitement of taking the train in from Arlington as a child and the wooden escalator clacktrapping… the sights and smells… even though I knew there would be nothing had, the trip was a gift of its own.